Dentures provide replacement teeth for some or all of the teeth in your mouth and they also augment areas where you have lost bone under your gum tissue. Dr. Warren provides dentures at our downtown Edmonton office. 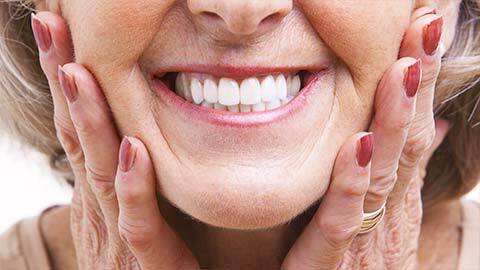 If you are missing teeth dentures can provide several benefits to your dental health. They can help restore chewing ability, they can improve the appearance of your cheeks and lips by providing underlying support, and they can help correct speech altered by tooth loss. Dentures come in full and partial types and may be removable or permanently fixed in your mouth. Full dentures replace an entire row of teeth with replacement teeth. 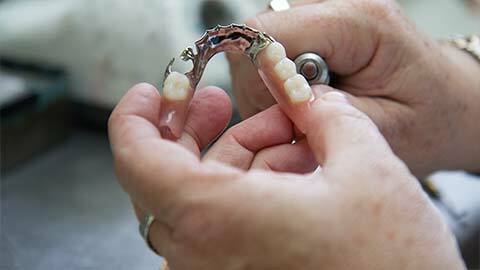 Partial dentures replace one or more missing teeth. Removable dentures are removed at night and for cleaning while fixed dentures are attached to dental implants or existing teeth and cannot be removed. To provide dentures we usually schedule at least five office visits. This allows us the time to take impressions of your jaws and adjust the fit and shape of your dentures. When the dentures are complete, follow-up appointments will be required to make final adjustments. If you have any questions about dentures or if you would like to book an initial consultation, contact our office today.